With the new DLC "Further Adventures in Finance and Felony" (FAIFAF) for GTA 5 Online you get the opportunity to become a CEO. In the previous DLC "Executives and Other Criminals," you already experienced the VIP status. But here CEO sounds out be much more powerful, so nothing like ran, elbow and brings you the place of the bosses. - Go to the website Dynasty8 Executive. - Here, there are four offices / buildings available for selection, the cheapest one cost you one million. - There are additional options that need more money. A table with all the additional options can be found below. 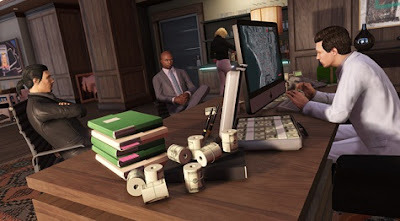 - Once you have your new building / office properly equipped, you just need to confirm the purchase - in this way you can become a new CEO in GTA Online. If you became a CEO then you can have the helicopter Volatus and a helipad free for you. In your office you can also play the TV game "Do not Cross The Line", but above all you can access the SecuroServ logistics network on the PC. - Goods are bought and sold only on special missions. - Buying missions: These are available in three different levels, depending on the amount of goods and of the risk that you wish to take. The higher the risk you take, the higher the profit you get. - Sales missions: Here you must weigh your offers and provide transport to the buyer. The higher your offer, the greater the demand - but beware of competitors who will do everything possible to prevent your sales.